On the adoption forums I frequent, one of the big questions I often see is “What is a birth mother looking for in the letter we are writing?”. The simple answer is, everyone is different. There is no way of saying your letter is the perfect letter to be chosen by everyone. Your letter, however, may be the perfect letter for a specific expecting mother. So let’s start of with the must haves. First, no matter what your agency says, do not address your letter with Dear Birth Mother or Birth Parent(s). This is simply an inaccurate term to use for the woman or parents who have created an adoption plan. The correct term is Expecting Mother or Expecting Parent(s). She has not given birth yet and to call her a birth mother is reducing her to a role she may feel obligated to fulfill. Please respect that until she has given birth and placed the child, she is still an expecting mother. If you don’t want to write Dear Expecting Parent(s) as your salutation, you can always chose a simple Hi, Hello, or Howdy. She may not see the difference consciously, but starting off the relationship in a place of respect goes a long way. Introduction: Thank her for considering you. Tell her your names and immediate information, like age and about any other children in your household. Body: Express your lack of understanding on how difficult her decision must be. Tell her you hope to meet her. Body: Elaborate on who you are. Tell her about your family, what brought you to adoption, and what your goals are in raising a child. Be positive and be yourself. Conclusion: Thank her again for her time, wish her luck in her journey and sign off with something positive. Include pictures that tell a story of your life. Get creative. It doesn’t have to look like a formal letter. It can include graphics, colors, pictures, bullet points, fun (yet easy to read) fonts, etc. Stick to a 8.5×11 letter, but you can use front and back. Salutation, as mentioned above, do not address her as birth mother or birth parent. Avoid any terms that are negative to adoption or imply you expect her to place her baby for adoption. Don’t try to appeal to every expecting mother, appeal to the one that is the right fit for you. This is a long term, open relationship, you want it to work. While being positive, don’t be overly flowery. Be normal. Don’t assume she considered abortion by thanking her for choosing life. Abortion may have crossed her mind, abortion may have been her first plan, but abortion may have never even been an option. Don’t be more religious than you actually are. Talk about God or religion the way you would with any day to day person. If it’s a huge part of your life, include it, otherwise, just give the basics. Don’t talk about your infertility in a lengthy depressing way. You can mention it in your introduction as why you came to adoption, if that is the reason, but this letter is not the time for a pity party. She has a big decision to make, don’t make her feel like she owes you a child. Don’t over promise and under deliver. Stick to honesty. 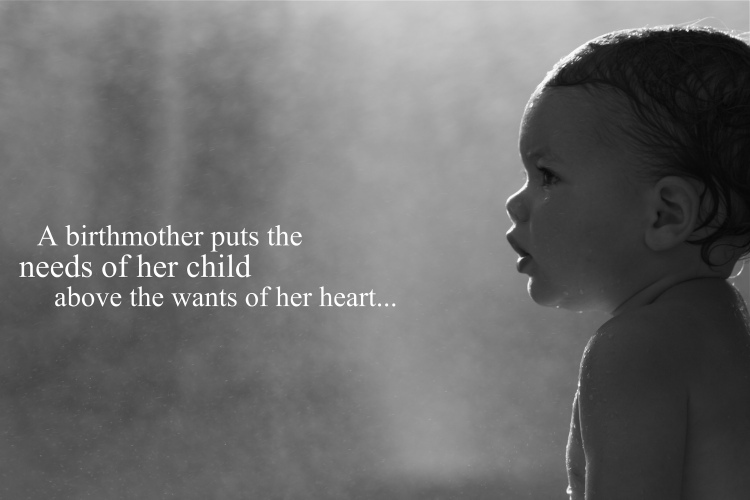 Don’t pretend to know what she is going through unless you have personally placed a child for adoption. Don’t include out of focus, under/overexposed, low resolution, or inappropriate pictures. This is not just about being politically correct or sugar coating terms to make the adoption sound more romantic, it is about respecting all members of the adoption triad and having a successful relationship in an open adoption. Birth Mother – instead use “Expecting Mother” or “Expecting Parent(s)”. Give up for adoption – instead use “Place for adoption” or “Create an adoption plan”. Closed adoption – instead educate yourself on open adoption. Thank you for choosing life – instead use “Thank you for considering adoption”. If you reference possibly keeping their child – instead use “parent your child”. This entry was posted in Adoption, Adoption Reform, Training and tagged adoption, adoption letter, adoption reform, adoption training, adoptive parents, adoptive triad, child, children, dear birth mother, dear expecting mother, expecting parents, negative adoption language, open adoption, positive adoption language. Bookmark the permalink. One minor disagreement: “Don’t try to appeal to every expecting mother, appeal to the one that is the right fit for you.” – I’d say, don’t try to appeal to anyone. Don’t focus on making someone like you, focus on *you. * Who are you? What’s important to you? What represents you? Chances are *you* will appeal to someone when you’re honest. I hate it when people thank women for choosing life. In some states, abortion isn’t really a viable choice at all. Medicaid doesn’t cover it, and abortion is expensive. Some states restrict abortion so much, that by the time a woman finds out she’s pregnant, she can’t have one even if she wanted to. Some states do not have clinics available. So, really, this woman may not have had a choice. I’d also say, include what you feel is right. Someone advised not to include wedding photos, but for us, those were the family photos we had, and we wanted to show our extended family. We had also been married 3 years previously, so it was pretty fresh, and we had a lot of pictures of ourselves from that time period (pre-wedding events, wedding, honeymoon). In our second profile, I think we included one wedding photo on our “About Us” page in our big profile. We didn’t include it in our letter at all. May I also recommend the book “Reaching Out” by Nelson Handel? It’s wonderful! I’ve kept it, even though we aren’t ever going to adopt again, just because I think it’s a great book. I agree with including what feels right. While this is just a simple guide, a person can defiantly stray outside this. Our agency told us to not include A LOT of wedding pictures. We had one page that included 3-4 pictures in our book of wedding pictures with a little story about our big day and how Joe included my son, Isaac, in his vows. Thanks for the book suggestion, I’ll check it out!